Wilson's Natural Landscaping, LLC. was founded in 2002 and incorporated in 2005, by Chad E. Wilson. 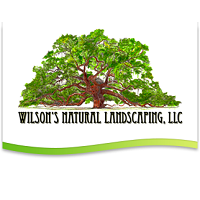 In 2011, Chad reorganized the firm and changed the name to Wilson's Natural Landscaping, LLC. to convey the correct vision of the firm. In preparation for the inception of Wilson's Natural Landscaping, LLC. Chad commuted from West Virginia, 360 miles one way, 1-2 times per week to Locust, N.C. to market the new firm. Chad worked a part time job in West Virginia as a school psychologist while managing his own landscape firm 'Wilson's Landscape and More', and attending West Virginia Wesleyan College during this time. Chad has a vast background in the industry, mowing grass since he was seven years old and building a strong local installation firm in West Virginia as time progressed.